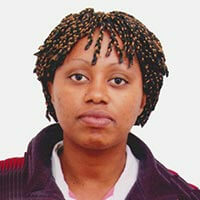 Brigitte Uwimana, a Rwandan national, is a Banana Molecular Breeder. Brigitte was formerly a Research Associate at Wageningen University and Research Centre in the Netherlands. Prior to this she had worked as a Research Assistant at the Rwanda Agricultural Research Institute (2005-2011) and a Focal Point Technician at ISAR/USAID/ CIAT/Agricultural Technology Development and Transfer Project, Eastern Zone, Rwanda (April– October 2003). Her research experience focused on applying molecular and statistical tools to support breeding in plants. She obtained her PhD in Plant Breeding (2011) and MSc in Plant Sciences (2007) with specialization in Plant Breeding and Genetic Resources from Wageningen University, the Netherlands. She received her BSc degree in Agriculture from Allahabad Agricultural Institute-Deemed University, Allahabad, Uttar Pradesh, India in 2002.